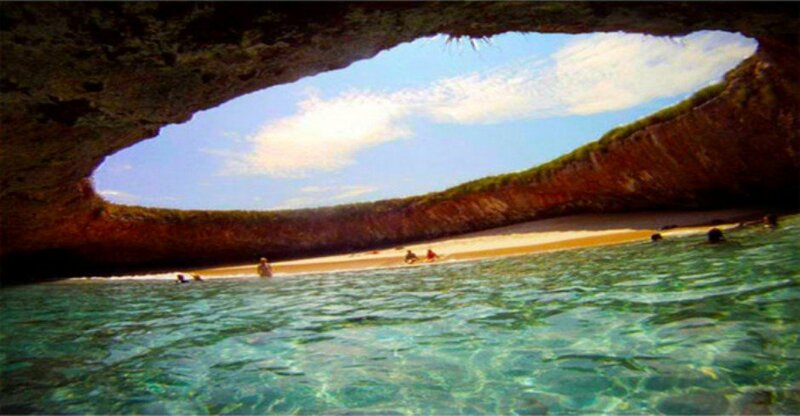 The Hidden beach is located on Marieta Island in the Puerto Vallarta, a few miles away from the Mexican coast. The beach is surrounded by rare wildlife. It is said that the Hidden Beach with its sandy seashore and crystal clear water is the world’s most attractive bomb site. The Marieta Island was used to conduct military tests before, as it was uninhabited. In the 1900 the beach was formed by a giant blast during target practice by the Mexican Government. Some say that the beach was formed as a result of volcanic eruption. The Hidden Beach is not visible from the outside. The only access to the beach is through the long water tunnel that links the beach to the Pacific Ocean. To reach the beach visitors have to swim through a small tunnel. The Hidden Beach is officially name as Playa De Amor or the “Beach Of Love”. Hot Water Beach is located in the Mercury Bay at the northeast tip of Coromandel Peninsula along the Pacific coast of New Zealand. At the Hot Water Beach, one can dig through the sand. The hot water from below comes to the surface to form a pool. The temperature of the water in the pool is as high as 64°C (147°F). Volcanoes develop underground reservoirs of superheated water. This water comes to the surface. Till it reaches the surface the water cools down. At the Hot Water Beach, there are two fissures from where the hot water escapes. Large amount of salts is present in this hot water. We can also find calcium, potassium, magnesium, bromine, flourine and silica in the water. 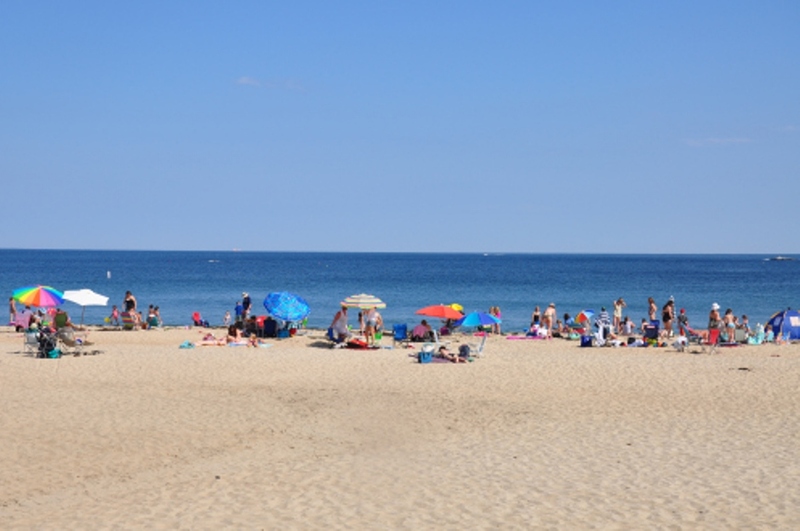 Singing Beach is located at Boston’s North Shore. At this Beach the sand sings and hence the name is given to it. Friction between the grains of sand causes the singing sound. The sand produces such sounds when there is a certain humid condition; the sand grains are between 0.1 and 0.5mm in diameter and it contains silica. The sound is produced when one sand grain rubs against the layer of sand beneath it. 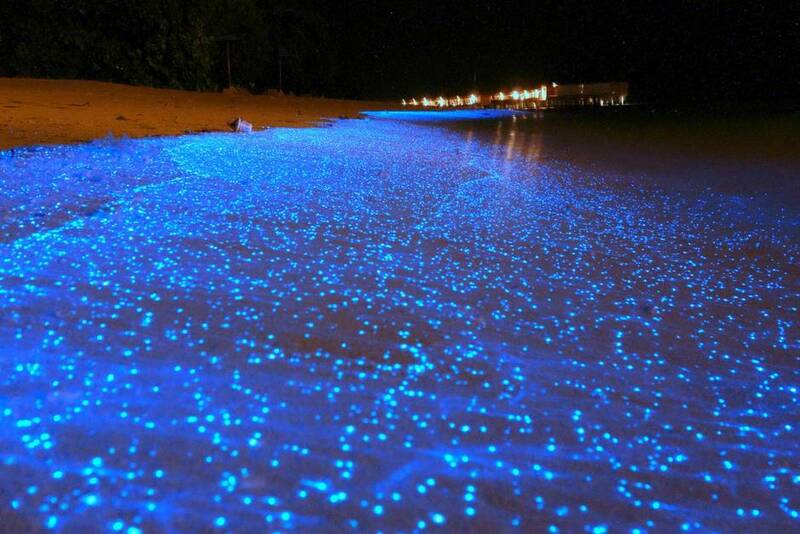 The Bio-luminescent Beach looks like a sky full of stars at night. This happens because of the presence of light emitting microorganisms present in the water. The organisms in the water which produce lights are bio-luminescent phytoplankton called Lingulodinium polyedrum. These microorganisms glow when they are stressed or agitated by strong waves. These microorganisms glow when stressed and reasons for their agitation include something that breaks the water like waves, a kayaker’s paddle or a surfer carving up the water. So even a boat going in water will leave a trail of lights behind the water. 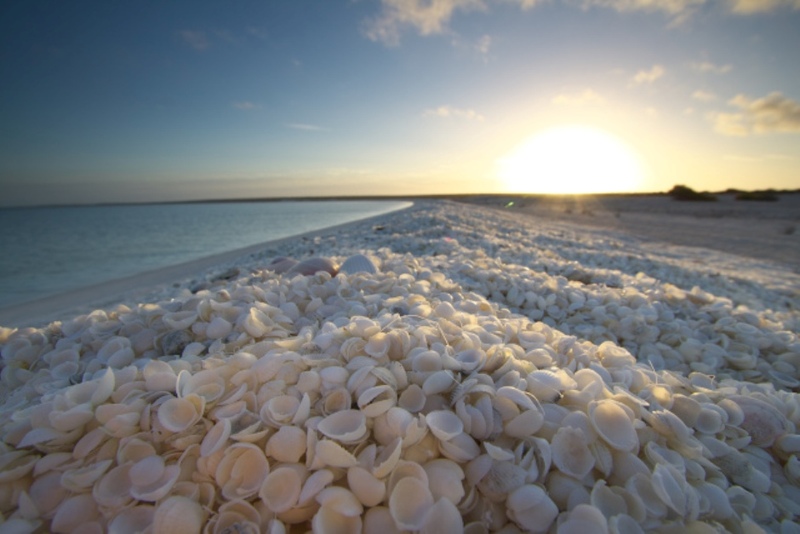 Billions of Shells can be found on the Shell Beach of Australia. These are tiny white shells of the cockle species Fragum erugatum. The sea water is hyper saline because of the climate there. Due to the high salinity of the water, the clams have no natural predators in that area and they are growing in huge numbers. They die naturally and are washed on the shore by the waves. The beach looks beautiful with its snow white shells stretching for a few meters followed by the aqua blue sea water.